Jakarta is a great city with plenty of formidable excursion potential. We can find a countless of excursion spots in this metropolis. A number of them are a stone’s throw away from Jakarta which are allowed to be explored. Every single site won’t only gives us multifarious experiences, but also different challenge. This is one of the most distinguished horse racing place. 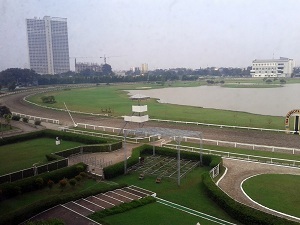 As the one of horse racing place in Jakarta, it became very popular in its epoch. It was built when Governor Ali Sadikin sat on the government throne in the 1970’s, which was received a great response when it opened for the first time. But then was once closed in the 1980’s in caused of local regulations ban gambling. Even so, the horseback riding activity was still accessible and became something noteworthy at that period. Nowadays, this place comes out one of the most visited and the most economical horseback riding sites. We have to pay Rp 20,000 for adults and Rp 10,000 for children to enjoy one lap horseback riding impression. What an affordable price, isn’t it? Apart from that, this location provides horses to rent, an area to tame horse in order to obey its instructor. The next place is located in Jl. H. Montong No. 23, Rt 08 / Rw 03, Ciganjur, Jagakarsa, South Jakarta, DKI Jakarta, 12630. This is a reputable horseback riding site in Jakarta and the nearby cities. Trijaya Equestrian is more personal and more exclusive place than Pacuan Kuda Pulomas and moreover used as an interesting playground for children in Jakarta. It extends miscellaneous horseback riding drills for sightseers, even if most of the visitors are the professionals and who has become the member of this place. As beginners, however we may come and own the infrequent sensation. We acquire professional horse instructors that keep us safe and comfy. 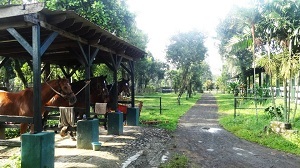 This place is one of the famous site known to locals in Jakarta for horseback riding. 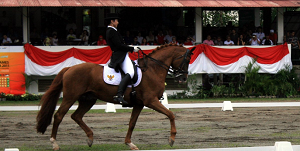 The reason is because the horse riders that is raised from this place participate in horseback riding competitions as SEA Games and etc, even they are the national team members of Indonesia. This place accommodates to all different classes of experiences, from beginners to professional horsemen. The address for this location in Jakarta is on Jl. Pelaten Raya No. 9 Rt. 7 / Rw. 10, West Pejaten, Ps. Minggu, South Jakarta, DKI Jakarta 12510. Other than offering horseback riding lessons, this specific location breeds and raises horses. Here, you can find many different breeds of horses from many places or originally from that location. This place is one of the favorites site from locals for horseback riding. It’s one of the inexpensive tourist attraction in Jabodetabek that is very unique and special for people to visit. This site is famous for its high quality services and horses and it is also used for a practice area for national athletes in Indonesia. This place is open to the public especially to those who wants to experience being horsemen. That’s why this location attracts many people as it has many things that the public can enjoy. Because of this, it’s not surprising that this place is frequently search by many tourist or locals. This place holds many lessons and accepts many young students who is interested or would like to be horsemen athletes in the future. This is to expand the knowledge of horseback riding to the public. 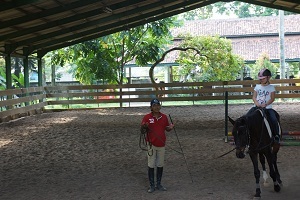 That was the complete recommendation of the many horseback riding places in Jakarta that you can visit. The horseback riding places mentioned above, are the perfect place to spend your vacation with your family or just to enjoy the sport. Hopefully this information helps.